While researching Leota Henson's family, I was delighted to discover that we are related. Her cousin, William Loudin, married my grandmother's half-sister, Rosetta Clinton. Members of that Ohio settlement ended up marrying their cousins in many cases. I'm happy to call myself a great-grand niece of Frederick Loudin. This is a tradition handed down from the first piano accompanist for the Fisk Jubilee Singers, Ella Sheppard, to Leota Henson, to my mother, Anne Gamble Kennedy. Now that my grandmother's friendship with Leota has been revealed to me, I know that Leota's role-modeling was at the forefront of my grandmother's thinking while she raised my mother. 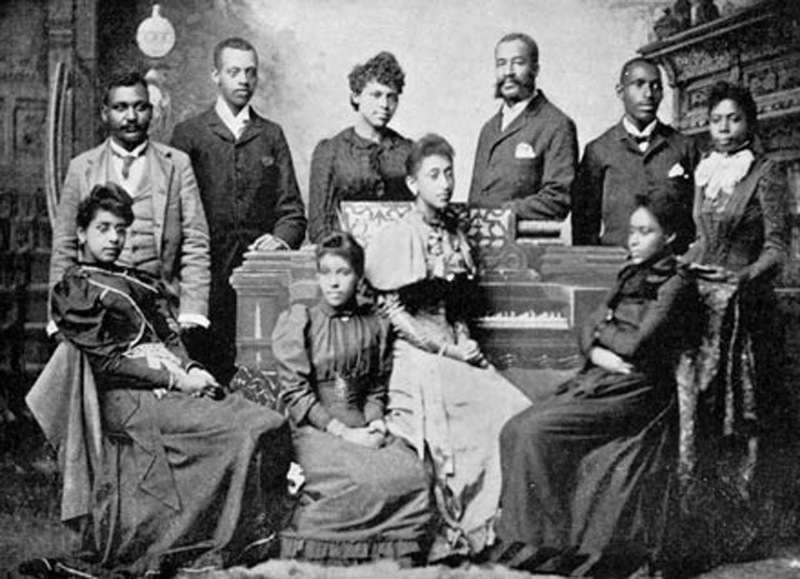 Here is part 2 of the writings of Leota Henson Turner, describing the world concert tour of Loudin's Jubilee Singers from 1888 to 1900. “During our stay of two years in Great Britain we made many friends and had more social invitations than it was possible to accept. In the year 1888 my uncle decided to take his company to Australia. One bright morning in the month of May we boarded the Steamer Orient of the Orient Line of steamships, which was lying at South Hampton and started for a six-week trip to Melbourne, Australia. We sailed down the Bay of Biscayne through the Straits of Gibraltar into the Mediterranean Sea. Our first stop was at Naples in Italy where we spent the day. Most of the passengers went ashore and spent the day sight-seeing. Many of us went out to see the ruins of Pompeii. This town is located on the side of Mt. Vesuvius and was destroyed hundreds of years ago when an eruption of the mountain took place. It was a very interesting trip. Many of the houses and streets have been excavated. We saw a baker standing in front of an immense oven filled with bread. He had a long handled shovel in his hand and evidently was just going to take out the bread when the eruption took place. After looking over the stores in Naples and buying a few curios we went back to the steamer and arrived in time for dinner, which was served at six o’clock in the evening. After dinner we sat up on deck and as we sailed down the very beautiful bay of Naples it was a sight well worth seeing. As the darkness came on and we could see Mt. Vesuvius in the distance pouring forth fire and smoke it made a sight one can never forget. In the next article you will read Leota’s description of the magnificent Sphinx and Pyramids, their stop in Aden on the southern corner of Arabia, the passage across the Equator, and their arrival in Melbourne, Australia. Recently I came across a notebook of letters written by my maternal grandmother, Nina Hortense Clinton of Zanesville, Ohio. This was my first encounter with a notebook of lined, onionskin paper followed by a blank, thicker page, so that the writer could put a piece of carbon paper between the pages and thus keep a record of correspondence. Of course, most of the onionskin pages had been torn out. And there were the two little pieces of carbon paper in the back of the book. The first letter is dated 1902, when my grandmother was 21 years old. She had traveled to Europe as part of a group of Jubilee Singers directed by Frederick Loudin. My grandmother wrote this first letter to her niece while all of London was filled with excitement over the up-coming coronation of King Edward VII. While going through a box of my grandmother’s papers and photo albums, I happened upon seven stapled, typed pages written by her friend Leota Henson. I recognized the name because my grandmother had mentioned her in her letters. Then I found this autographed photo of Leota in one of the photo albums. It turns out that Miss Leota had studied piano at the Conservatory of Music in Leipzig, Germany, was the piano accompanist for Frederick Loudin’s Jubilee Singers, and traveled with them throughout Europe, Egypt, Arabia, Australia, India, China, and Japan. The trip took six years, ending in 1900. My grandmother joined the group later in 1901. I know you have been anxiously anticipating the continuation of this letter from my grandmother Nina Hortense Clinton, dated March 27, 1902, while she was in London on tour with Frederick Loudin’s group of “Jubilee Singers.” A side note: since all of this resurgence of interest in my ancestors, I have found two family trees online which show that we are related to Benjamin Banneker! It is actually his sister Mary who is my direct ancestor. Several “new” cousins have contacted me on Facebook and Ancestry.com. The feeling is indescribable. Until now, I always felt that people were interested in me and my parents because of what we did. Now, people are interested in me because of who I AM! It is a wonderful feeling. Recently, while lounging on the beach on Singer Island in south Florida, I was reading a delightful book titled The Secret Wife by Gill Paul. When I first opened it I saw a family tree listing the names and dates of the descendants of Queen Victoria and Prince Albert, and their connection to the Romanov family of Russia. According to the family tree, the granddaughter of Queen Victoria married Tsar Nicholas II, whose family was executed after the Bolshevik Revolution of 1917. The book was really a story of how the spirits of the ancestors influence our lives in the present.